We’ve all seen the holiday bucket lists (which I LOVE and even plan on making one for the winter season). Normally, these bucket lists are family activities to complete during the holiday season. November and Thanksgiving are all about being grateful for what we have. So this bucket list is a little different. Instead of completing fun holiday tasks, this one focuses all about giving. Each day, children will choose one card out of the bucket to determine what good deed they need to complete that day. The activity will be something that will better someone’s day! Here are the directions below to implement at home or in the classroom. Download all of the files at the end of this post. 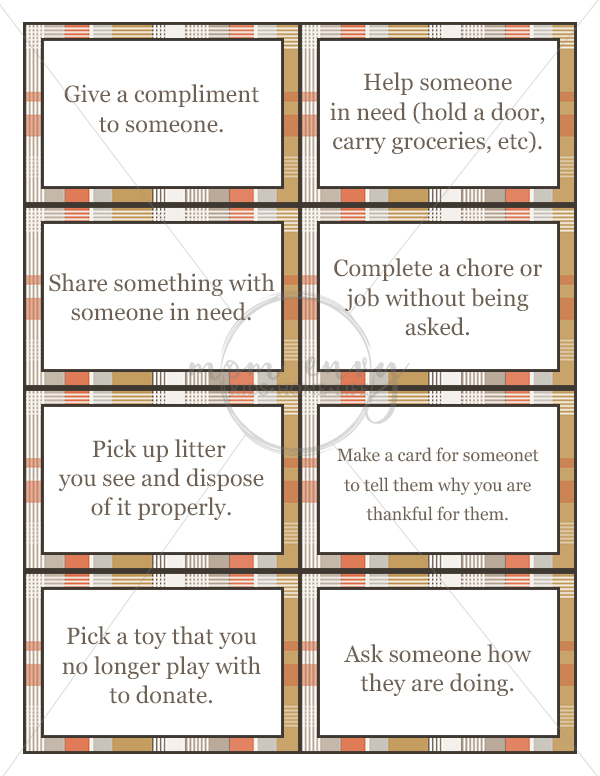 Print a set of the Home bucket cards. Look through the cards and take out any that do not fit your family (i.e., if you don’t have a pet, only one child, not age-appropriate, etc). Use the blank cards to come up with any additional giving back tasks you can think of. 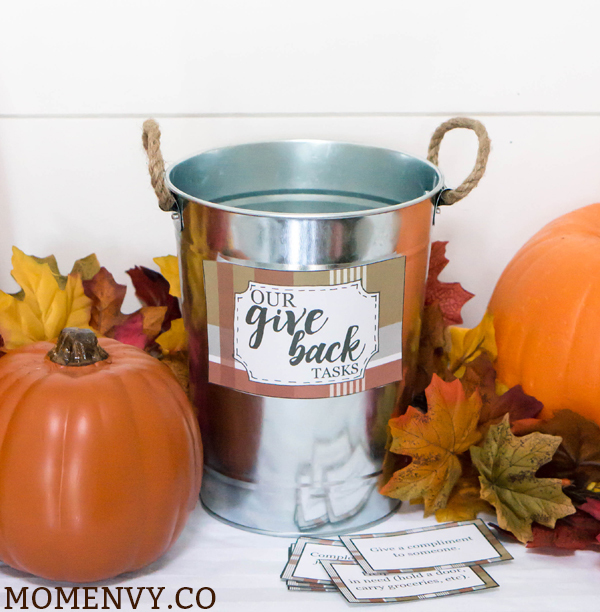 Place all of the cards in the bucket based on the number of days you will be using (days in November leading up to Thanksgiving, 30 cards for the entire month of November, etc.). Each morning, pull a card out of the bucket. Discuss how you can complete the good deed that day. At the end of the day (perfect dinner conversation), discuss how you completed the good deed. Discuss how it made you feel, why the deed was important, how it made the person/people feel that you helped, how else you could have helped them, etc. Print the cards on cardstock so you can use them each year. Print additional blank cards to use in future years as your children grow older. Have your children help you come up with good deeds they could add to the bucket. Have a bag or container near the bucket to place the cards that have been used. At the end of the month, review all of the good deeds you have completed! Print a set of the Classroom bucket cards. Look through the cards and take out any that do not fit your class (i.e., not age-appropriate, not something you would like your students to complete, etc). 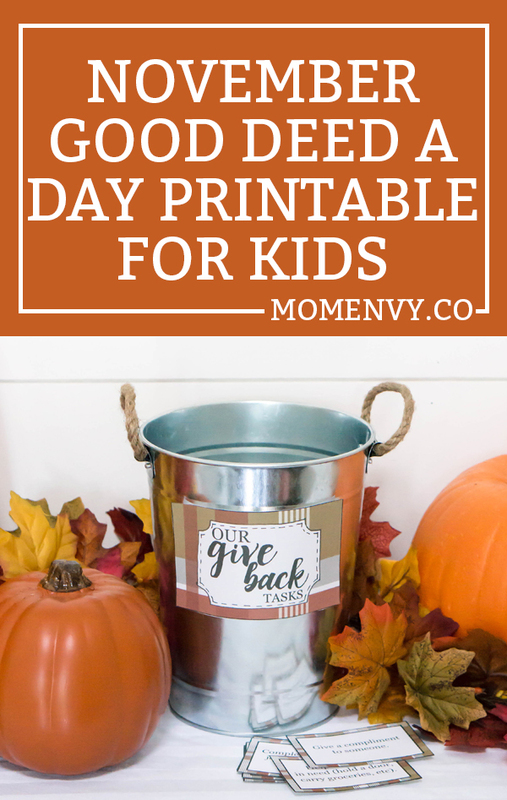 Place all of the cards in the bucket based on the number of days you will be using (school days in November leading up to Thanksgiving, school days for the entire month of November, etc.). Each morning, pull a card out of the bucket. Discuss how you can complete the good deed that day. Some of the cards (such as writing a thank you note) may require giving students a short amount of time to complete the activity. This would be perfect for morning work, SSR, indoor recess, writing, etc. At the end of the day, discuss how you completed the good deed. Discuss how it made you feel, why the deed was important, how it made the person/people feel that you helped, how else you could have helped them, etc. Once you have emptied the bucket, have students complete the additional writing activity below if desired. Print the younger students writing paper. Have students draw a picture of their favorite good deed they completed that month. Have students write a sentence about the good deed they completed or have an adult write what good deed they drew. Print the older students organizer and writing paper. Have students complete the good deed organizer. Have students use the organizer to put their ideas in paragraph form. If desired, have students draw a picture to go with their writing. Print the cards on cardstock and laminate so you can use them each year. 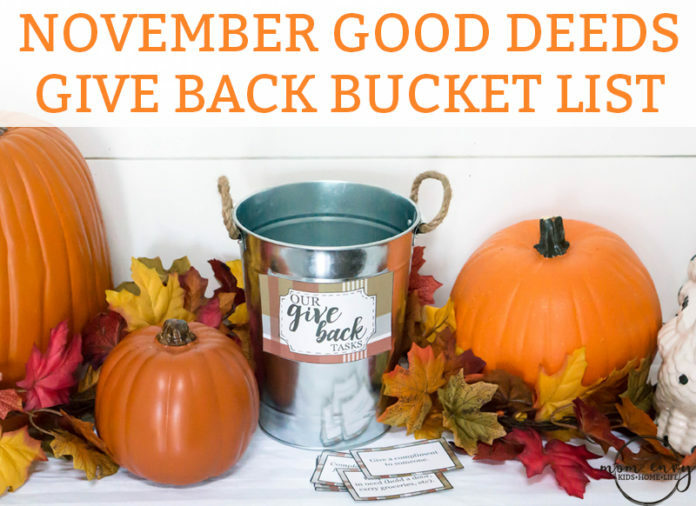 Have your students help you come up with good deeds they could add to the bucket. Here is an example of some of the bucket list cards from the at home pack. These are some great books that relate to giving that would be perfect to read in connection with this activity. Are you a teacher looking for more free printable activities? Click here to check out my teacher posts. You must be on a computer (a tablet or phone will not work). Click the links below to download the files. They are zip folders that must be unzipped after you download them.